So the past few days… or has it been a week already? has been hectic! Fashion Week started for me with the IFB conference where I met a lot of the blogger gals in real person which I had been looking forward too the most! The conference was good and really started this thinking-spin of what I want to do with the blog etc blah blah blah... I think you can find write-ups on the conference on the IFB site here. So these outfit pics are right before the “Nine West Blogger Breakfast” where we got a great dilicious in store breakfast and got to explore and pick our favorite pairs of shoes to wear for fashion night out. No need to say that we ( me and Caroline of Fashion Squad ) went for the taupe leather boots that can be worn folded over or over the knees and whats better then to start your day with a breakfast surounded by shoes haha.. 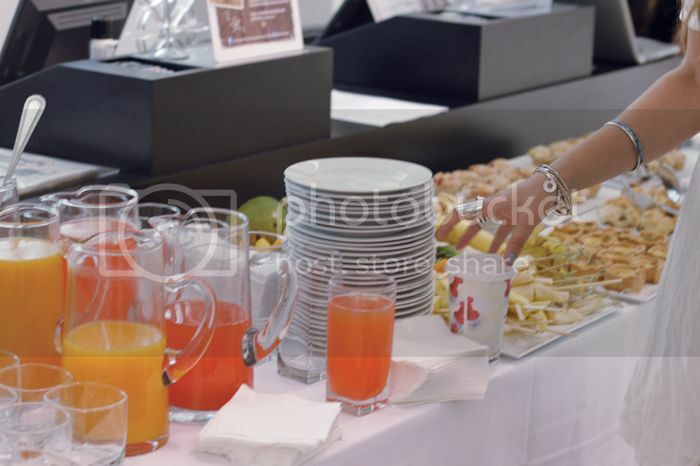 The random hand reaching for the orange juice is Gemma from FadetoBlack and you can see Rebecca from the Clothes Horse in one of the pictures too! Nice 🙂 Great skirt ! Love those shoes you’re wearing!! eeep! Lucky Girl. I think I was at the Instyle Lunch when this was going on. this looks so fun! sad I’ve missed all this… but it looks like you guys are having a blast. Blogger power. Breakfast, piles of shoes and cool blogger chicks? That sounds like an awesome day! breakfast+shoes seems like a great combo! Your sense of color is amazing. Very lucky ladies! I could not be more jealous of the fabulous boots you picked out. They are gorgeous!!! I love the skirt! reminds me burberry prorsum. 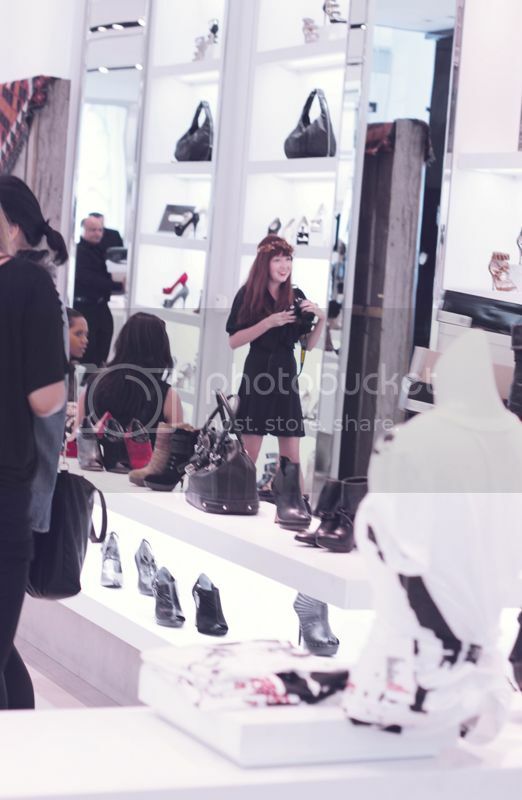 Those F21 boots are so gorgeous, F21 have really upped their game this season. I LOVE NINE WEST SHOES! Sorry for e-shouting, but my goodness. Those taupe boots are nice, I’ll have to go and try them on. youre too cool for school love. You look gorgeous, I love this look! Glad you had such a great time, and I’m seriously impressed with the shoes Nine West is turning out! the shoes are dope! and you’re so lucky to be there in NY for the NYFW!!! Is the best combination after you wake up!!!! Great outfit!And love all the shoes! i’ve been growing quite fond of subdued tones lately, and that outfit definitely strikes my fancy 🙂 great look! So in love with our new shoes!!! So glad you had such a fun time!!!! ooh yum, you look gorgeous! this is so cute. i LOVE. the. shoes. love this look so much, especially those shoes with socks! Great idea! i adore ur look from head to toe! Super leuke outfit! Die schoenen zijn geweldig! The whole outfit is amazing but seriously those shoes with the socks are AWESOME! I love it! It was so good to meet you the other day. I am relieved but shocked at how fast time went by. The Blogger breakfast looked like a lot of fun! Sehr schöne die erste Fotos!! aww.. i tried on that same skirt in H&M but they didnt have my size 🙁 booo! it looks really great on you tho! stunning outfit, I love your shoes! this is such a great outfit; especially love the sweatshirt top and those boots! you’re so pretty! and your outfit is amazing! perfection.